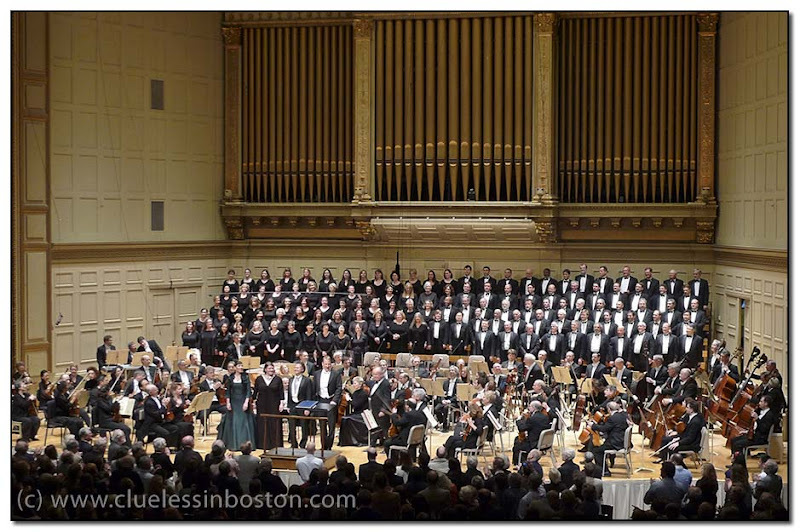 Standing ovation for Beethoven's Ninth Symphony last night at Symphony Hall. Led by Bernard Haitink in the final program of the season, featuring soloists Jessica Rivera, Meredith Arwady, Roberto Saccá, and Günther Groissböck, with the Tanglewood Festival Chorus. Tomorrow night's concert (8:00pm) is going to be streamed live on the internet, information here. I consider myself fortunate to live in a city with such a great orchestra. I envy you this orchestra, and this marvellous place: the large organs are so impressive! Fantastic! I would love to attend this event! Possibly this photo is a bit illegal. In this kind of spectacle is usually forbidden to take pictures, but the blog is the blog. I like it, great shot!